Tangerine Walk-In Counselling Services is doing something special: providing more service and reducing wait time for children and youth up to the age of 18. (The Brampton location serves youth up to age 21.) What’s more, their caregivers, looking for mental health services in Peel region, are also getting support. These free walk-in services are the result of a collaborative partnership between Associated Youth Services of Peel, Peel Children’s Centre, and Rapport Youth and Family Services. EENet’s Pam Gillett has produced a new edition in the Promising Practices series. Click below to read the full story. Promising Practices profiles innovative practices and initiatives from around Ontario. In 2004, families were waiting 12 to 15 months for counselling services. Eager to improve client experience, Peel Children’s Centre decided to pilot Single Session Therapy (SST). By training one manager and one therapist in a pilot project, the agency began offering clients a choice. Families could sign up and wait for more traditional 4-, 6- or 8-week sessions, or they could access one counselling session right away. Many families opted for SST and reported a high degree of satisfaction with the services. Acting on the results of the pilot, the entire counselling team was trained and supported to adopt the single session model. A majority of families felt that their needs were met after just one session. In 2011, the Ministry of Child and Youth Services funded a dozen new positions, leading to Tangerine, the first children and youth focused mental health walk-in counselling service for Peel region. Within the framework of a ‘franchise model’ the entire team of 12 staff, including supervisors from each of the three partner organizations, was trained by Peel Children’s Centre on the single-session model. The program was fully implemented in 2012, and supported by a steering committee, an implementation committee, a common evaluation framework, and a community of practice. A Tangerine session is based on the question, “What is the key issue bringing you here today?” Approximately two hours in length, it includes a one-hour clinical session and a 30- to 40-minute break followed by a brief feedback session. During the break the clinician will consult with a colleague to determine feedback and recommendations and to gather resource material that may be helpful to the child/youth and/or family. Children and youth are welcome to return to Tangerine as often as they wish to discuss other issues. Families waiting for other services in the children’s mental health system are encouraged to use Tangerine as a support. Gradually word is spreading in the community and as a result families and youth are self-referring to the program. Schools are the program’s greatest referral source, representing over 35% of the referrals, with physicians second at almost 20%. Tangerine providers are committed to enhancing community awareness to increase use of the service. Also, anti-stigma components have been built in by design. The name of the service and the design of the business card are friendly and welcoming to youth. Nowhere on the card does it say Mental Health Counselling. To help minimize stigma, remove barriers to access, and better serve the prominent ethno-cultural groups in Peel, including new immigrants, Tangerine is building partnerships with relevant community service providers to offer single session care. Tangerine is offering ‘booked’ appointments at the Multicultural Inter-Agency Group of Peel location. Providing mental health care in an environment that is trusted and familiar helps to enhance referrals and provide greater client satisfaction. Another innovative partnership aiming to reach youth directly has resulted in the co-location of Tangerine counselling at Dixie Bloor Neighbourhood Centre. Recognized as an important hub in the local community, Dixie Bloor Neighbourhood Centre offers a wide range of social and recreational services to meet the needs of the community, including settlement services to new immigrants in over 19 languages. In 2013, Dixie Bloor offered space to Tangerine to meet the needs of the neighbourhood youth. After a slow start the program is gaining momentum through an increased number of referrals from social workers and guidance counsellors in local schools. In the 2012 – 2013 fiscal year, Tangerine saw 786 clients and an additional 77 clients over the age of 18, surpassing expectations. Program feedback continues to be overwhelmingly positive. Evaluation of the program is ongoing and a report is expected in 2014. Future plans for the program include the expansion of Tangerine to five days a week. 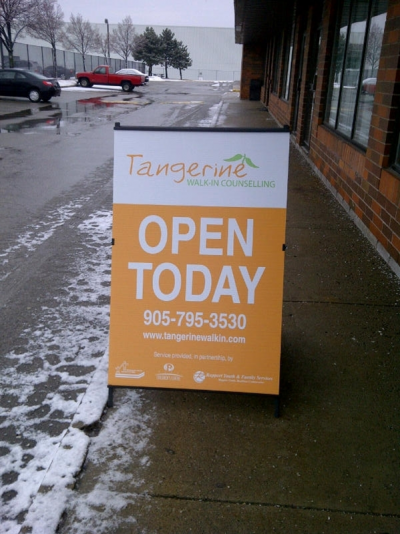 For more information on Tangerine Walk-In Counselling, visit www.tangerinewalkin.com.